It's Dad's birthday and Hattie is helping her mother to get everything ready for the party that night. 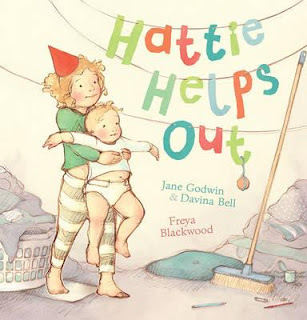 There's a huge amount to do, but with Hattie's help it should easily get done in time. So, Hattie makes the place cards while her mother does the laundry. Then together they bake the cake. Hattie's mum suggests Hattie has her afternoon nap while it cools, but Hattie doesn't think she needs naps anymore. Eventually — and parents everywhere will know how this happens! — Hattie's mum agrees to lie down with Hattie, just until she goes to sleep. But it's not Hattie who nods off … it's her mum! Who will stick the biscuits together, decorate the cake, arrange the flowers and tidy the house now? Hattie, of course! This delightful picture book is so full of warmth, humour and love. This is real family life. Parents always have too much to do. Kids love to be involved in things and help out. Things don't always go according to plan. Sometimes our child's way of doing things isn't necessarily ours. And sometimes that's just the way it should be!